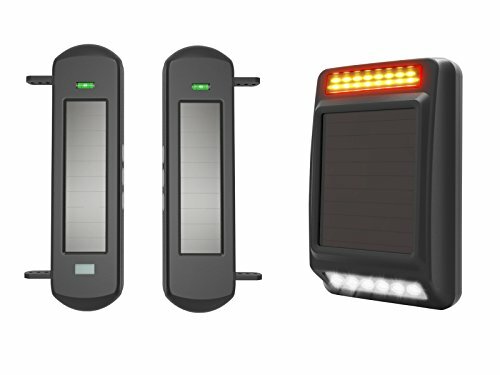 The infrared sensing terminals of the solar sensors can be mounted up to 300 feet apart,and will send a wireless signal back to the solar receiver up to 1/2 mile away anytime the intruder passes between the sensors;the solar receiver has two ring tones optional(alarm and doorbell),meanwhile the solar receiver also has the ultra bright LED lights,capable of illuminating the surrounding area at night,therefor imposing a deterrence to the intruders;the KIT is powered by built in lithium ion batteries those are recharged through the solar panels during the day, requires no wiring and easy to install. It is the ideal for all types of outdoor intrusion alarm application,such as driveway/fence tops/windows/etc. --Fully expandable system; up to 32 groups of solar sensors or remote controllers can be connected to one solar receiver, while one solar sensor or remote controller can be connected to unlimited solar receivers. --Solar receiver has 2 ring tones optional(alarm and doorbell), which can be easily switched by the remote controller; Sound level of the alarm triggered for intruding object within 10m range is 90dB; during the alarm, Red LED flashes and white LED lights up, capable of illuminating the surrounding area, therefore imposing a deterrence to the intruder. --The solar sensor is equipped with self-calibration tools (calibration hole and digital calibration screen), capable of finishing long range calibration in minutes. --Powered by built in lithium ion batteries those recharged through the solar panels during the day,cloudy and rainy days can charge the batteries normally( (note: when there is no natural light, the built in batteries can support 3-5 days of system operation, but the system is not suitable for long time indoor application). --Waterproof IP66 Fully-enclosed design,resistance to rain/fog/snow/etc(working temperature range from -40℃ to 70℃). If you have any questions about this product by HTZSAFE, contact us by completing and submitting the form below. If you are looking for a specif part number, please include it with your message.